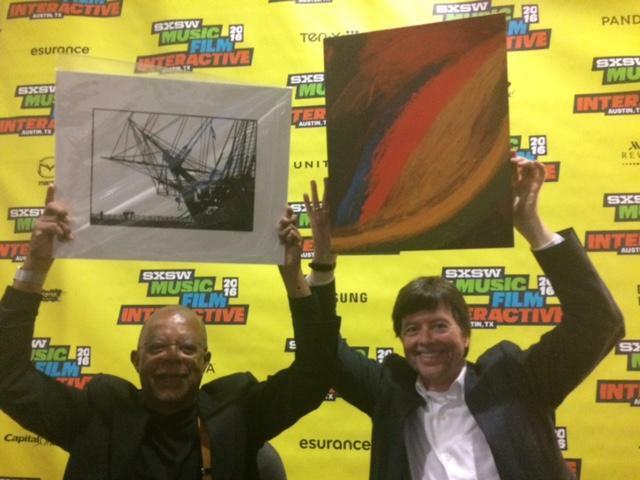 At South by Southwest, Harvard’s Henry Louis Gates Jr., left, and filmmaker Ken Burns, hoist work by artists helped by ArtLifting. Burns is holding a painting by Nick Morse. A shout-out to Nick Morse, son of longtime Globe music critic Steve Morse and one of the artists helped by ArtLifting, a Boston-based entity that assists homeless and disabled artists sell their creations. ArtLifting’s Liz Powers — she calls herself “Chief Happiness Spreader,” not CEO — was at the South by Southwest Music and Media Conference this week, and Harvard’s Henry Louis Gates Jr. and filmmaker Ken Burns, both ArtLifting supporters, hoisted a few paintings, including one by Nick. “Here’s a happy surprise,” Nick’s proud father posted on Facebook alongside the picture (above).